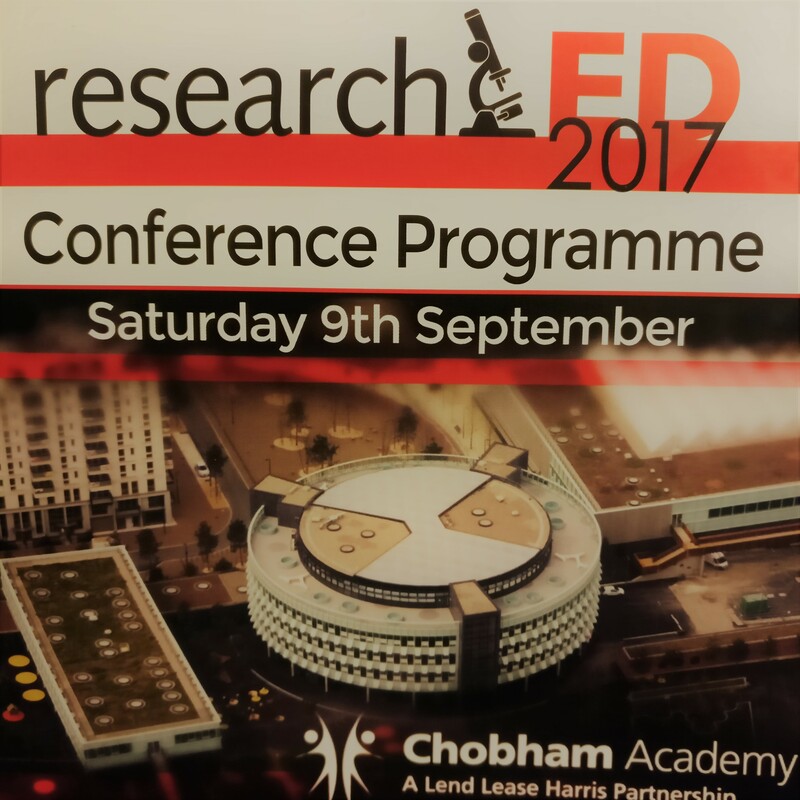 researchED 2017 – The Best Yet? I’m going to say it. rED17 was the best one yet. There have been researchED conferences that rival of course, and the light-up pens have reached legendary status, but the atmosphere at this one was something different. Whether it was the venue, Chobham Academy, with its circular building that forced delegates to cross paths and talk as they found their next session, or whether on a more personal level I felt like I knew more people there, there was a buzz I’ve not sensed in the same way before. Despite recent naysaying (and outright attacks) around researchED there appeared to be lots of people who put their hand up to say it was their first time so the great conspiracy doesn’t seem to have put them off. A noticeable feature was the conversations going on. In previous years dining room chatter was filled with overhearing people talk about the speakers they’d seen, in awe at who they were, and this year people seemed to be discussing the session and the ideas. Instead of the queue in the loos being all “I saw X, I love him. I’ve read all his books.” there was a definite vibe of “I went to see X talk about Y. That really fits in with what we’re trying to do with year 9”. 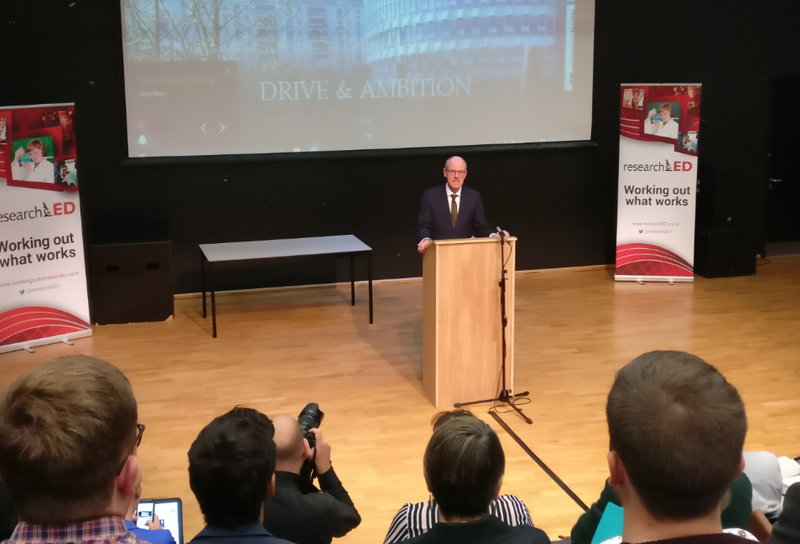 That’s not to say there weren’t ‘big hitters’ – 2017 attracted speakers such as Minister of State for School Standards, Nick Gibb and Ofsted Chief Inspector, Amanda Spielman; but I wonder if one of the achievements, and I really mean achievements, of researchED over the past few years is to make it normal to see and hear these people in person and it’s taken away some of that awe – allowing the debate to take hold. Nick Gibb tried (I think. I’ll be generous for a moment) to stick up for researchED and its contributors by talking about those academics who hadn’t engaged as being stuck in their ‘ivory towers’. I have to say, I think a considerable amount of ivory-tower-placing comes from us, not them, and the more we do engage and interact the further down the tower they come. It works both ways. Tell me what’s new with that? The most impassioned bit was the first bit and that was pretty much reading Tom’s blog out loud (we’re at rED, and whether we agree or not, we’ve probably read Tom’s blog haven’t we?). The Schools Week article made it all sound punchy – you can view it here and decide for yourself. So. To the good stuff! My second session was Sam Sims with Katie Magee and Dhana Gorasia talking about Journal Clubs. 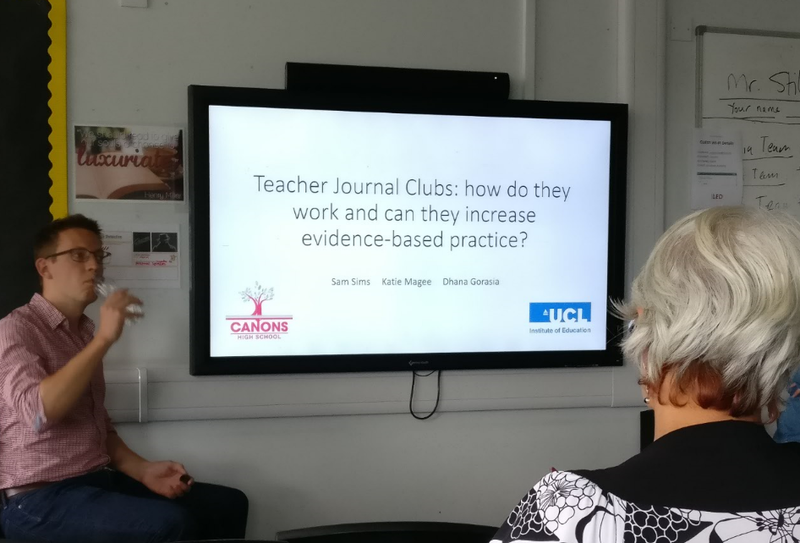 Now, I do like a journal club and this was brilliant to go to as it was Sam’s 2014 session that boosted my explorations into journal clubs to what I’m doing now. The session explored a pilot study of journal clubs as a way to break behavioural habits around teaching and the theory behind this. The second half featured examples of how it had worked at Canons High School. I always make a point to stress that journal clubs aren’t a policy meeting and to avoid getting bogged down in how one paper could be used in school; Katie and Dhana showed how the two can work together with requests for papers on specific strategies and discussions that lead to implementation in practice. I liked the advice that journal clubs can be used to spot positive strategies and behaviours that are already happening in schools and enable these to be shared more widely. There seems to be a few exciting journal clubby things on the horizon, particularly with the Chartered College of Teaching, so I’m looking forward to seeing what happens and getting involved where I can. Session 3 found me in the Britney-infused sardine can* that was David Weston’s session on Toxic schools. 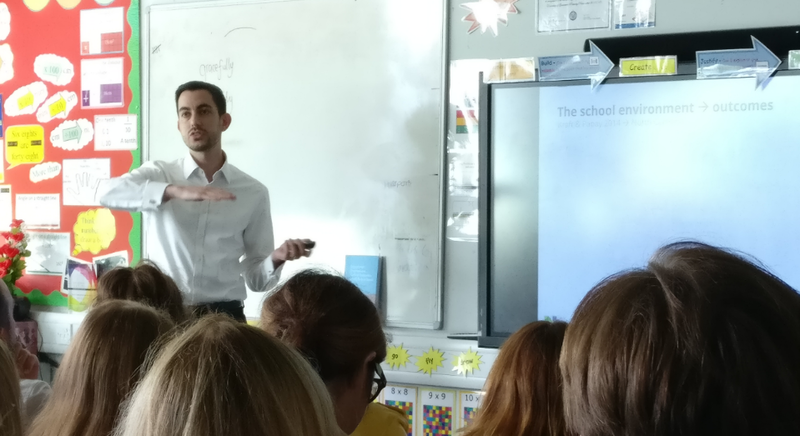 David explored how the school environment impacts on outcomes, looking a lot of things that Kev Bartle had talked about in York last summer. Coming from a school that has historically had a small number of staff with close relationships that is now expanding hugely, I’ve thought about this idea of trust and leadership a lot recently as the dynamics are being forced to shift. David took us through various biases to recognise and avoid (aided by occasional Britney) with some pointers to take back. His presentation’s here if you fancy it and I’m looking forward to any follow up sessions involving late nineties/early noughties classics with a dance routine. I always find that once my own session is done I can sort of float through the rest of the day without the weight of it (literally, lugging biscuits is HARD) but it does make my notes a bit more relaxed. I went to see Martin Robinson give a warning about Growth Mindset. It does concern me that this is a bit of a bandwagon that looks fancy and evidence informed so it was good to pick up some ammunition for the time it descends on us here (and Martin was lovely, obvs). I went to an Institute of Ideas conversation about Mental Health in schools that was interesting. I agree with points that if we are over-cautious we risk medicalising ‘normal’ responses from pupils and found this idea that we have a ‘cultural script of fragility’ hit a point too. However I’m in a school where our pupils have (by definition) a range of mental health issues and I can see the problems of under-diagnosis and lack of intervention too. A teacher’s job is to teach but they’re with us a considerable amount of time – quite often the only stable time they have, and we have a role in safeguarding them too. As has become normal at these things one of the best sessions was hosted by a local boozer (and a proper boozer it was too) where I had some great conversations with lovely people. Some about education, some about shoes, some about the Midsomer Murders Tour… I’ve stepped in to defend researchED a couple of times recently and I think we all know there are people who aren’t going to be swayed either way. It was, as always, a diverse day with rushing round behind the scenes that looked ripple-free from the outside. The familiar company was great, the new faces were also great, and I was left feeling overwhelmingly positive (even after the karaoke) about all the opportunities we have to do great things. If people choose not to engage with researchED then I really hope they find something they do like because it’s a shame to miss out.